Process: Whether a completely new roller or recovering your existing core, each roller is carefully stripped and grit blasted to provide an optimal bonding surface. Once cleaned and blasted, the roller is wrapped with a rubber meeting customer specs. After the curing process, the roller is mounted on a lathe and turned down to the proper diameter dimension. silicon fuser roller OEM MAKING ,WE CAN MAKE AS YOUR REQUIREMENT. Procedure high temperature curing and foaming Certificate ISO, FDA, RoHS, SGS Features ecofriendly, non-toxic, safe, high temperature resistant, non-sticky, anti-aging, excellent insulating property, etc. Payment term: T/T 30% in advance, 70% balance before loading Loading Port Foshan or canton Delivery time About 10 to 20 days. Sisic ceramic rollers as the key part of roller kiln,its function is supporting and conveying calcined ceramic products under high temperature sintering process. The technical parameters of sisic ceramic rollers directly affected the application performance,quality and yield of calcined ceramic products. So sisic ceramic rollers is the important part for roller kiln,its quality directly affects the normal operation of the kiln and the yield and quality of the ceramic products. Manual wheel with sticky paper recycling, plastic surfaces ensure the long-term self-cleaning effect. 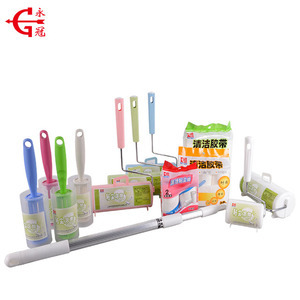 ABS plastic, aluminum and other materials, a variety of handles, the unique flexibility of the wheel, the wheel spin freely, use, comfortable feel. 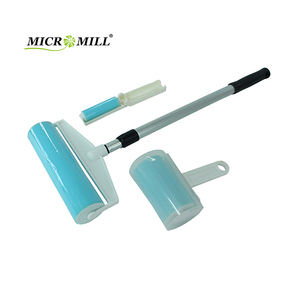 Manual Dust Removal Silica Gel Roller applies equally to the glass surface, film and other flexible plate surface clean. We also can design and manufacture rubber mold and rubber products by ourselves. We value every customer and every order be it one piece or thousands. Please feel free to contact us if you have any further questions. 2.characteristics: with excellent oil resistance, high wear resistance, aging resistance, good heat resistance, strong adhesion. 3. the shortcomings of nitrile rubber is not resistant to ozone and aromatic, halogenated hydrocarbon, ketone and ester solvent, is not suitable for the production of insulating materials. silicone rubber pinch rollersApplication Gravure printing machine, letterpress printing, offset printing machine, flexo printing machine etc. Guangzhou Foshio Technology Co., Ltd.
4:And after that we will process rollers&rsquo; dynamic balance to improve machines&rsquo; stability. 5:And before the spindle head has been installed ,we will make the second dynamic balance. All of our materials are thermostable, high pressure-resistant, non-toxic and eco-friendly. Polyurethane can reduce factory maintenance and OEM product cost. Polyurethane has better abrasion and tear resistance than rubbers, and offering higher load bearing capacity. Compared PU with plastic, polyurethane not only offers excellent impact resistance, but also offers excellent wear resistant and high tensile strength. Alibaba.com offers 18,564 silicone roller products. About 17% of these are rubber rollers, 3% are lint rollers & brushes, and 1% are cake tools. A wide variety of silicone roller options are available to you, such as free samples, paid samples. There are 18,564 silicone roller suppliers, mainly located in Asia. The top supplying countries are China (Mainland), Hong Kong, and Taiwan, which supply 98%, 1%, and 1% of silicone roller respectively. Silicone roller products are most popular in North America, Western Europe, and Domestic Market. You can ensure product safety by selecting from certified suppliers, including 7,942 with ISO9001, 2,916 with Other, and 555 with BSCI certification.